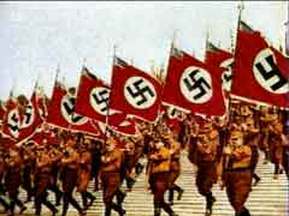 Was Hitler’s Germany a Totalitarian State? A Totalitarian state is one in which the leader, in this case Adolf Hitler, has total control of the Government and the people. In practice the term is often is used to describe a political situation where a small group of people, or one organisation, has total authority over a nation. In Hitler’s Germany there were many characteristics of a Totalitarian state. The Government ran and censored the media. All forms of communication were liable to interference from above and could, and were, heavily censored. This removes freedom of speech, therefore enabling the government to influence popular opinion via propaganda and false news messages. Propaganda within Nazi Germany was highly effective. The Nazi’s realised the importance of the Radio and newspapers as a means to communicate with the masses. they were also highly aware of the force that these media’s had and the level of influence that they had over the population. carefully planned radio broadcasts, rallies and films were used to convince the public that Hitler and the party had the overwhelming support of the masses. the news was engineered to show successes brought about by the parties policies and techniques such as subliminal messaging were used to ‘brainwash’ the masses into a state of belief and hysteria. In effect all news, rumour and opinion within the state was produced or influenced by the Government, a classic sign of a totalitarian leader exerting his control. Clearly not everyone is susceptible to propaganda. You cannot force somebody to listen to the radio, read newspapers or watch film shows. To combat the potential threat to the utopia that was created by Hitler by these people alternative methods of ensuring control were necessary. The secret police was publicised, it’s role was to find enemies of the state. These people would quite often be publicly humiliated or even tortured. Such actions making people think twice before questioning the state. Likewise the police and Gestapo had the authority to remove people from their homes and send them, often without trial, to concentration camps. Once again this acted as a deterrent but it also ensured that the more determined opponent of the state was removed from the public domain. In essence Germany under Hitler was a very good example of what a totalitarian state is/ was. People did not question decisions, no matter how absurd they appeared to be. 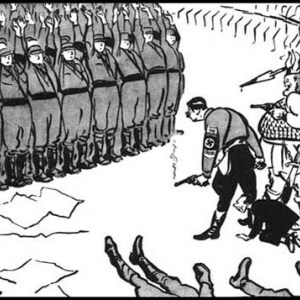 It was evident that working against the party, or even being perceived as a potential threat would lead to prison or worse (the Night of the Long Knives for example). Through careful coercion, manipulation and misleading information the authorities could, and did, do as they pleased as the people either knew nothing about actions being taken or were too afraid to speak out about them.